Help us build a “Wall of Love” for this year’s Valentine’s Day. 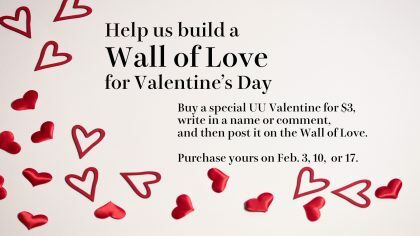 Buy a special UU Valentine for $3, write in a name or comment, and then post it on our special wall. See us in the Social Hall after the services on Sunday Feb 3rd, 10th and 17th to purchase yours!